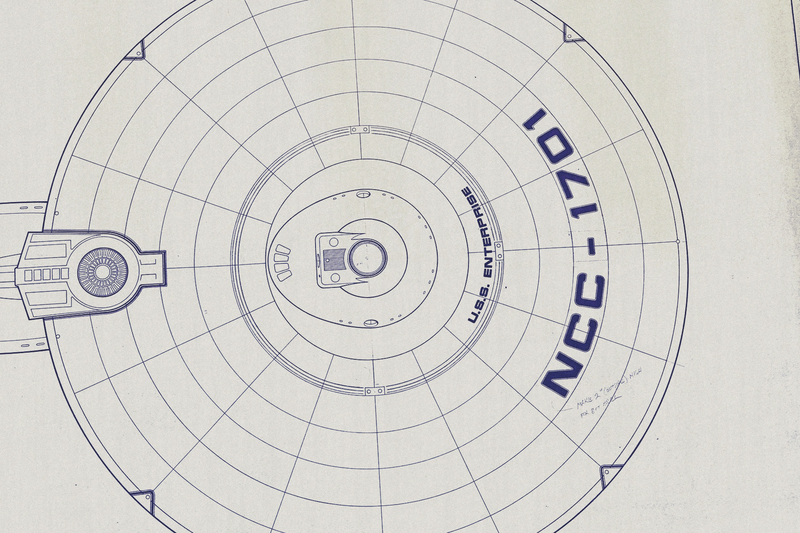 After a slight delay I received one of several original Star Trek: The Motion Picture (ST:TMP) production drawings I had recently acquired of the Bridge and B/C deck superstructure last week. 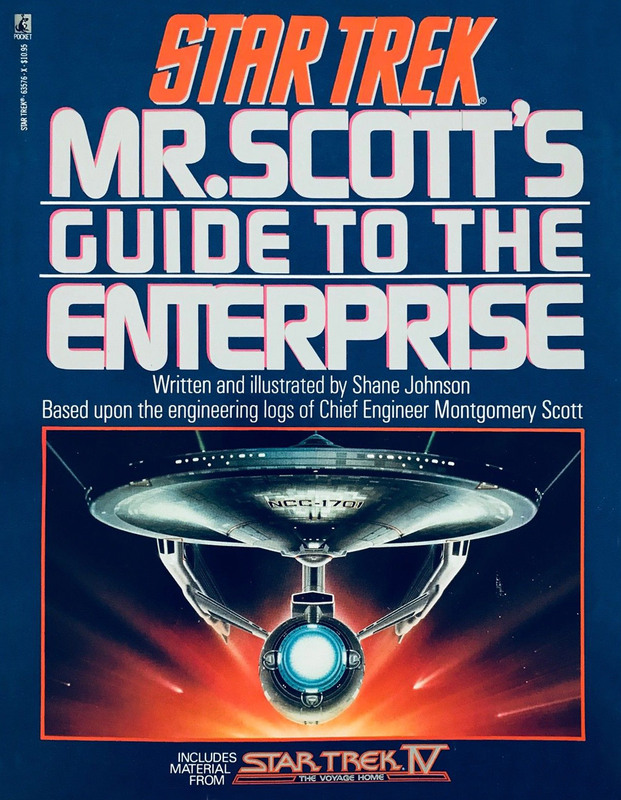 The first one to arrive was sold to me by Lora Johnson, who was the author of Mr. Scott’s Guide to the Enterprise. Outside of Trek, Lora is best known for the novel Ice under her former name of Shane Johnson. Her works include numerous original novels as well as Star Trek reference books including the aforementioned Mr. Scott’s Guide, the Star Trek: The Next Generation Technical Journal and Worlds of the Federation. She also authored the Star Wars Technical Journal and contributed to the canon of the Star Wars universe. She is a historian of US spaceflights and was a design consultant on HBO’s From the Earth to the Moon mini-series. More recently, she created the Virtual Alamo interactive online exhibit for the University of Texas at Arlington. So why was she selling these drawings? Well after suffering prolonged and debilitating stress-induced health problems that nearly ended her life, she dropped out of the public eye in 2008 and underwent correction of a congenital intersex condition, transitioning from male to female. Her ongoing health issues were a main part of why she was selling some of her of Trek materials. Which has of course been a mixed blessing. It was great for me personally in that it afforded me the chance to obtain one of the key original production sketches on the redesigned Bridge superstructure. But it is simultaneously not so great in that it’s a good person having some health issues along with their attendant expenses which brought about these pieces being offered up for sale. That said, she does have a GoFundMe page to try and help raise money in order to be able to receive the neck surgery she needs. If for whatever reason you hold or aspire to the Star Trek ethos of IDIC (Infinite Diversity in Infinite Combinations) or are just a compassionate person, then you might be consider clicking over there to help her out. Enterprise miniature, by Leslie G. Ekker. As to the drawing itself, it was done by Leslie Ekker on large graph paper at what seems to be a 1:1 scale to the actual miniature (which itself was built at a 1:120 scale) and based on a design concept that Andrew Probert had a major hand in (more on that below). It is undated, but was part of a set of at least two other sketches done on graph paper by Ekker. One of those had a 1979 Paramount Pictures copyright stamp on it. Around this same period we have a “side panel detail” production drawing, also done by Ekker and that one was dated “4/17/79”. So this sketch—and the companion ones—were most likely done sometime between January 10, 1979 and April 17, 1979. What makes this a very interesting, and in some ways pivotal one, is that it—along with it’s companion graph paper sketches—appears to be where the basic lines, size and shape of the redesigned Bridge dome, housing, and the B/C deck superstructure were worked out. Digital re-creaton of the Ekker port-side elevation production sketch. Again, while additional details which are missing from this drawing, and some minor refinements occurred when the new superstructure piece was built and detailed, I am fairly certain this is the baseline to derive the size, shape and proportions of the basic superstructure from. That of course is with the caveat that if I had actual access to the model with some calipers and armed with a good digital SLR camera, etc. I could absolutely determine what ended up be built. 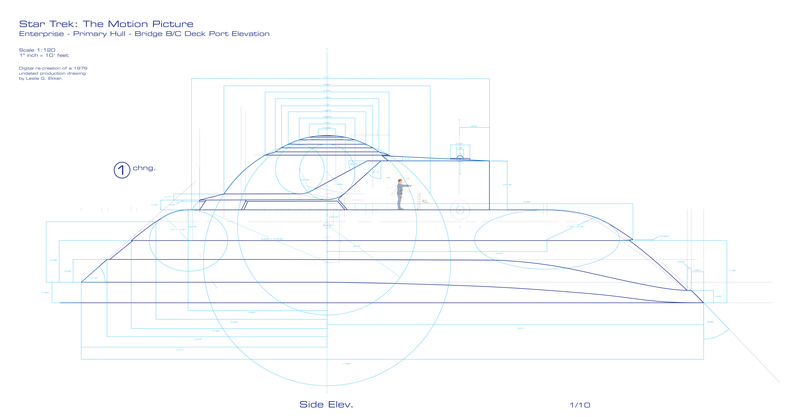 But since that chance is remote—at least for now—this will be the basis for the most accurate drawings and measurements I can develop at this time, unless and until other drawings from the ST:TMP production come to light. At any rate, Lora sent me a professional high-resolution scan of the drawing before she shipped it. Richard Taylor’s original Bridge design. The original scan was done at 600 pixels per inch (PPI) which is somewhat overkill, and so I will not be publishing that one here on my blog. That said if for some reason anyone wants to get a hold of the full 600 PPI image, I would be open to doing so by request. miniature with the original Bridge superstructure clearly visible. I took the scan and brought it into Adobe Illustrator to digitally “redrew” it. I cleaned up and made the lines consistent, perfectly straight—where the lines were of course intended to be straight—and cleaned up some of the slop in the drawing. 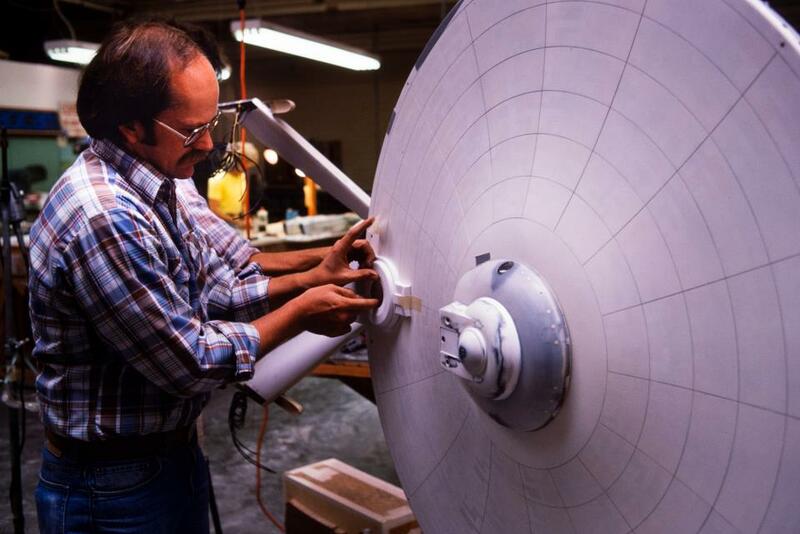 This was after all a “sketch” used to work up the basic configuration of the redesigned Bridge superstructure from what was originally designed by Richard Taylor and built into the model by Jim Dow and his team at Magicam. There are conflicting versions of how this Bridge exterior redesign came about. Some people have stated that it was initiated by Doug Trumbull after Robert Abel & Associates were basically fired from the production in February of 1979 when Trumbull’s Entertainment Effects Group (EEG) was brought on to “save” the pictures special effects production. However it seems that a redesign of it was already in the works before then given that you can see a good portion of the Bridge dome and housing redesign in what is sort of interim configuration in the concept drawing shown on the right. That drawing was done by Andrew Probert and dated January 10, 1979. You can see in it the basic contours of the new Bridge dome and housing, though some of the detailing would be later refined and altered. 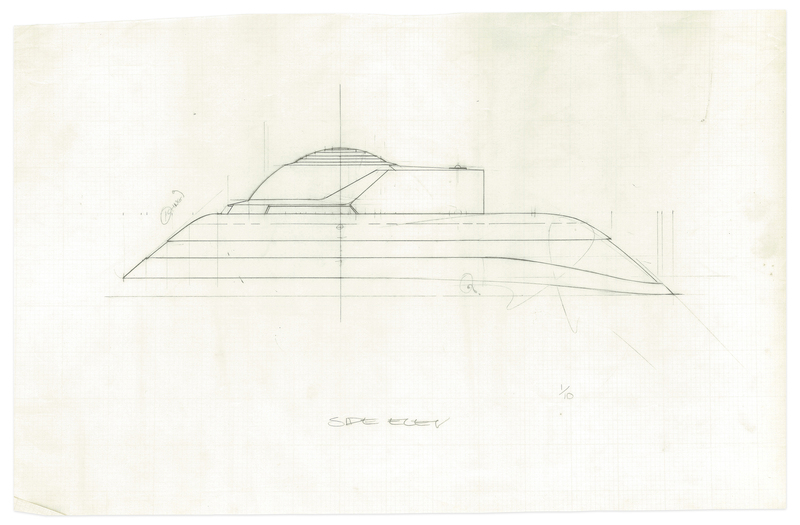 However the B/C deck portion of the superstructure in Probert’s concept sketch retains many of the elements present in the original Taylor design. Elements such as the port and starboard docking ports, the overall “round” shape, the lack of the recessed porthole and lounge window alcove, etc. filming miniature, as seen at the Christie’s auction in 2006. You can see details such as the aforementioned “alcove” in this image of the final Bridge superstructure, shown in the at the right. 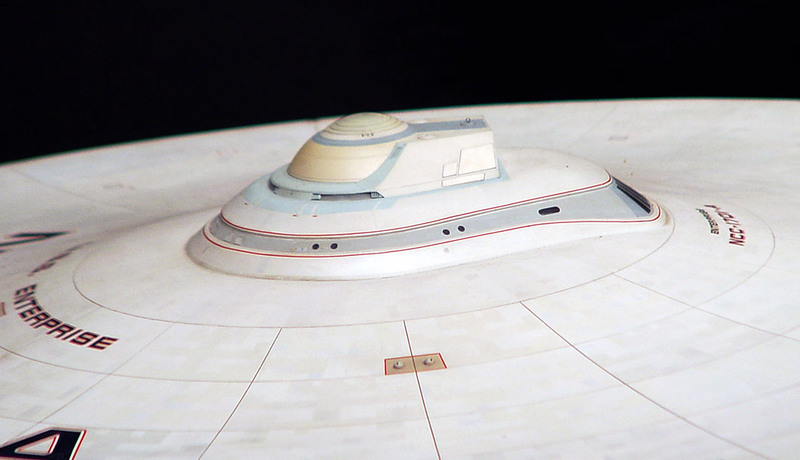 That photo was taken long after the model was re-painted and had her markings altered to “1701-A” for the final 3 original-cast feature films. It was was taken during the public viewing when it was being sold at auction at Christie’s in 2006. There are two other production drawings I recently acquired of the Bridge superstructure—both done by Mr. Probert—which finally arrived last night. I will get those scanned at high-resolution and post them for film afficiando and Treker-geek use once I have them in the digital realm. They will help fill in some additional “in universe” scaling, and one of them was the source of the Ekker miniature production drawings I posted about previously and am in the process of finishing re-drawing digitally. 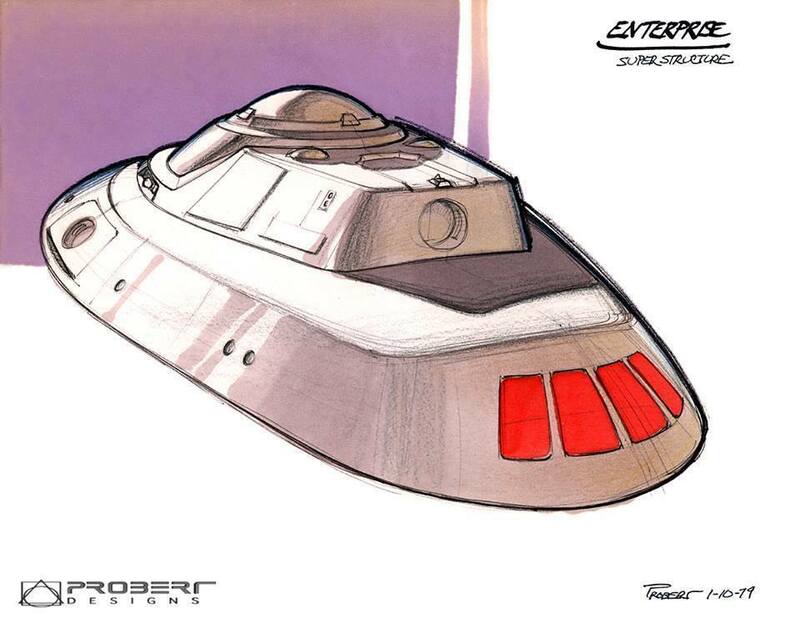 This entry was posted in Project Enterprise, Projects and tagged Andrew Probert, B/C deck, blueprints, bridge, concept art, Doug Turmbull, Jim Dow, Leslie Ekker, Lora Johnson, Magicam, Officer's Lounge, production sketch, Prop Store, Richard Taylor, Robert Abel & Associates. Bookmark the permalink. A list of past projects.